Kevin here, and I believe I can say with firm confidence that all of us on the Wekk Podcast enjoyed reading Andy Weir’s “The Martian.” There may have been an issue with a scene here and there, but for the most part, we all had a great time with the book. So, I thought I’d take this opportunity to learn about author Andy Weir’s journey to literary stardom. Here now is a list of some facts I learned recently about the making of this book, as well as what Andy has up his sleeve next. Enjoy. Andy’s path from writing for his own pleasure, to now having a Hollywood movie made from his novel, is amazing. One thing Andy says in interviews is that he never actively marketed his book. He simply wrote it and people wanted to read it. He initially published each chapter on his personal website. Once he finished the book, some readers said it was too cumbersome to read the whole thing on a webpage, so he created a couple of e-reader compatible files and uploaded them for anyone who wanted them for free. Then, some readers said they didn’t have the technical know-how to take these files and stick them in their Kindle, so he went to Amazon and uploaded his book for readers at a price-point of .99 cents, the lowest price he could charge. (He was not allowed to offer it for free, which was his original intention.) Once on Amazon, his book started selling quite well until it hit Amazon’s Top 10 Sci-Fi e-Books list, and that’s when his life changed. Random House took notice, he got an agent, a book deal, a movie deal, and he’s already writing a second novel. (Mentioned below.) Big things come from small beginnings, and Andy has championed the e-book business because without it he would not be where he is today. Some writers write outlines, some interview people, some do lots of research in order to get the facts right. Andy Weir went a step further. 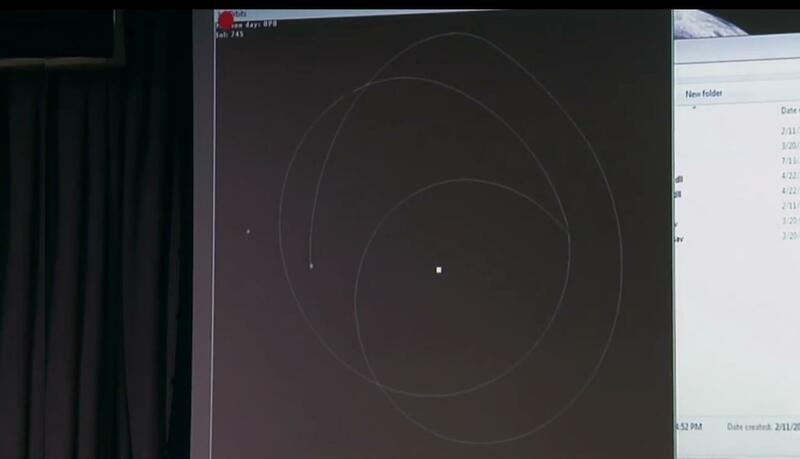 Since he wanted to be as accurate as possible, Weir, who is a computer programmer, created a program to simulate the exact position of the Earth, Mars, and the Hermes spacecraft at every point in his story. Here is the actual computer program Weir created to plot the orbits of the Earth, Mars, and the Hermes spacecraft. Shown here is the full Hermes flight path. Click for a larger image. Not only did it help him figure out the exact flight path of the Hermes, but it also showed him the exact distances between each orbiting bodies so that Weir could accurately portray the communications between the Earth and both Hermes and Mars. That level of commitment seems to border on the obsessive, and we thank Andy for that. Well, “hate” is a strong word. Let’s say he disliked the cover when it was shown to him. The cover I refer to is the North American version (shown at the top of the page) that features an astronaut in a white spacesuit surrounded by a rust-orange cloud of dust. To make the cover, an artist used a photo of a Space Shuttle astronaut during an EVA on an actual shuttle mission. The Mars duststorm was photoshopped around the figure to complete the image. Not only did Andy Weir not like it, he pointed out in an early draft of the cover that it contained a reflection in the astronaut’s helmet that showed the space shuttle’s cargo bay. (It was quickly corrected prior to publication.) 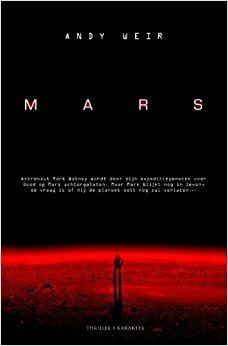 Anyway, since it’s common for books to have different art in other countries, Andy has mentioned that he likes the Dutch version the best, which is located below. In the book, the initial calamity that befalls Mark Watney is caused by a mega-sandstorm that aborts the mission. Andy has has said in interviews that his book’s sandstorm actually would feel like a two kilometer-per-hour wind on Earth and would not have been a threat to anyone on Mars. But, given that the protagonist needed to be stranded, and most people think that Mars dust-storms are ferocious, he took a bit of artistic license and made it into a super-storm. Andy Weir has said that he wanted Mark Watney to be an “astronaut” who simply looked at the situation as a problem to be solved instead of dealing with the psychological negativity anyone might face after being abandoned on Mars. 6. What Is Andy Weir Writing Next? Once again, from the recent Reddit AMA, Andy wrote: “I’m working on my next novel, Zhek, which is a more traditional sci-fi novel. It has aliens, telepathy, faster-than-light travel, etc.” In other interviews, he described this story as “epic” in the literary sense of the word, and it’s one that may take several books to complete. Well, now we know a little bit more about “The Martian,” about Andy Weir, and about his immediate future. What did you think of “The Martian?” Did you agree with our comments during the podcast? Let us know in the comments section. Next postWekk Podcast – Ep 15 – What a lovely Round-Table!